The Clean Energy Institute’s focus is from the molecular level of energy conversion materials, through the advancement of energy storage devices and also adding intelligence to the electrical grid. This is our “molecules to miles” approach to accelerating the creation of a scalable clean energy economy. Our institute is organized around two main research areas: Advanced Materials for Energy and Energy Systems & Integration. 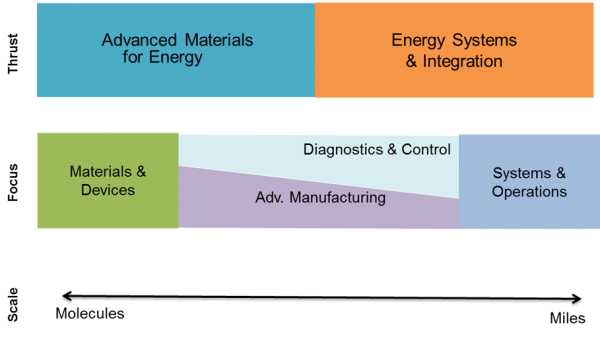 Advanced Materials for Energy (AME) researchers focus on developing novel materials for solar energy conversion and electrical energy storage devices, as well as high throughput manufacturing methods that are well suited to low cost solar and battery technologies. Our basic approach is to design and synthesize new materials with sophisticated molecular and nanometer-scale control of structure and composition. This level of control leads to outstanding energy harvesting and storage properties and breakthrough device performance. Our work cuts across organic and inorganic materials. Energy Systems & Integration (ESI) researchers understand energy infrastructure and work to ensure research advances in solar energy and electrical energy storage have the broadest possible impact. New energy technologies like solar energy production and massive battery storage will have the greatest impact if they are co-developed with sophisticated information technology. The goal of ESI research is to lay a foundation for the innovative software and hardware tools that will accelerate the integration of solar energy and electrical energy storage with systems and the grid, enabling a scalable clean energy future.